But then trying to feed PARIS in as another key, or adding it to existing key doesn’t seem to yield much. Very good, but you should chop off the question part before decrypting the remaining code. Well done. I’ll have to think up another one. How hard do you think these would be to crack without knowing the answers? Basically the repeating key is the weakness. It seems to be that the key doesn’t repeat very often over the plaintext question before it starts to repeat over the next block of ciphertext, hence frequency analysis doesn’t have much to go on. It would be even stronger if the keys were generally longer. The brute force approach might produce good results though – unless the questions or keys were not normal english words, which they need not be. 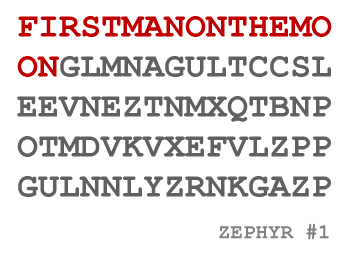 There must already be a name for this kind of cipher/puzzle – I can’t have invented it first. Except that the cypher is commutative, so basically you’re just making a very long key. It’s much the same as if you just applied the vigenere cypher on top of itself, but in this case it’s shifted along. The same process could be applied to create a key that would decrypt the entire message in one go. So assuming the various keys line up right and don’t overlap you could end up with a single key that’s the length of the encrypted text (with no repetition). I believe if you were using a one time pad etc then it’d be impossible to decrypt a vigener cypher with a key as long as the message (that was suitably random), as there’d be no repetition. Not 100% sure about that though (never do cryptology alone).